HANOI, Vietnam - Up to 21 people were killed and a huge foreign steel project was set ablaze as anti-China riots spread to the center of Vietnam a day after arson and looting in the south. "There were about 100 people sent to the hospital last night. Many were Chinese. More are being sent to the hospital this morning," the doctor at Ha Tinh General Hospital told Reuters by phone. Foreign Ministry spokesman Le Hai Binh confirmed one death in the clashes, and described media reports and accounts on social networking sites of higher casualties as "groundless." The Planning and Investment Ministry blamed the clashes on "extremists." 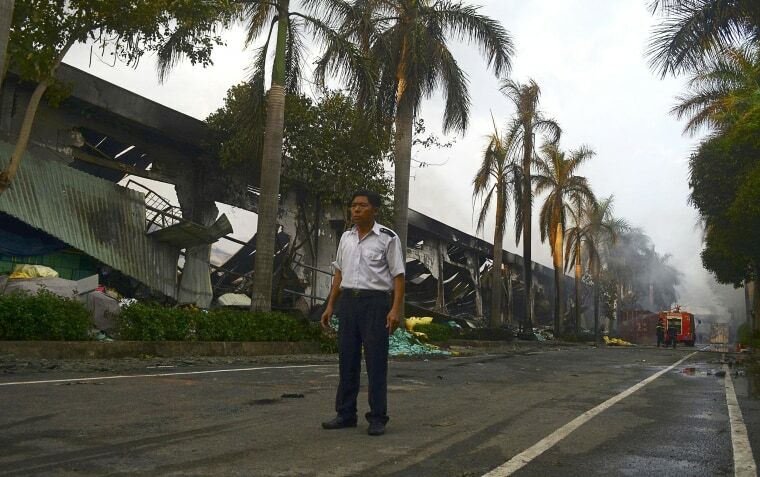 Formosa Plastics Group, Taiwan's biggest investor in Vietnam, said its under-construction steel plant in Ha Tinh was set on fire after fighting between its Vietnamese and Chinese workers. One Chinese worker was killed and 90 others injured, it said in a statement. The anti-China riots erupted in industrial zones in the south of the country after protests against Beijing placing an oil rig in a part of the South China Sea claimed by Hanoi. China expressed serious concern over the violence in Vietnam and urged it to punish criminals and compensate victims.